In the writings of the New Covenant, twice is it stated that the Messiah is “the Word.” While He is given many different titles throughout the pages of Scripture, this one is of particular interest, as it can be understood in several different ways. The concept of Messiah being “the Word” will be looked at here in a very hands-on approach. Going straight to Scripture, it is seen prominently that the use of the term “Word” throughout the pages of Holy Writ speaks directly to the Word of the Creator. However, it is not to the entirety of His Word that the term “Word” immediately refers. Rather, the term is used repeatedly to point us specifically to the Torah, the Law that comprises the first five books of Scripture. For instance, in the lengthy 119th Psalm, which is focused on the centrality and endearing nature of the Torah in a believer's faith, the psalmist there calls the Law the “Word” forty-two different times! Yeshua the Messiah is therefore equated with the Torah / Law when the text of the New Covenant twice calls Him “the Word.” The context of Scripture affirms this for us. Now, when one speaks of the Torah, to a Hebraic mind, it is basically impossible to consider it at any length without factoring in the way in which the Torah itself has been preserved for us from antiquity. It has long been transmitted, since the initial giving of it at the Mountain in Arabia, in the physical form of a scroll. The Hebrew word for “scroll” is SEFER (most accurately pronounced as identical to the English term “safer”). Whenever Scripture speaks of the “book of the Law,” it is in Hebrew SEFER HATORAH – the “scroll of the Law.” This is how the Word has come handed down faithfully to His people – in scroll form. It is significant to note that the Hebrew people have held the production of a SEFER HATORAH to very precise standards. These traditional production methods have existed for thousands of years. Most of the very minor differences that do exist have arisen within the last two centuries, due to the development of enhanced methods of production not available to the artisans in antiquity. Even with these minor variances that are run across from time to time, a scroll of the Torah will overwhelmingly adhere to ancient rules regarding how it is made. In fact, so stringent are the many rules guiding a scribe's writing and producing of a Torah scroll, that to deviate from the thousands of traditional laws and regulations can very easily lead to a scroll being considered pasul - that is, unfit for use in worship and study! The scribe is thus expected to reproduce a faithful copy of what has come before from generations past. Why are these guidelines so important? Although they are not decrees laid forth in the revealed and preserved Word of Scripture, by the end of this study, one will likely see that the Spirit of the Holy One Himself had a hand at inspiring and maintaining the construction of the scroll in the hearts of His people for a very good reason. It is in these details that the believer can perceive the Messiah in truly astonishing ways, and appreciate better the concept that He is the Word made flesh, the living SEFER HATORAH. Looking at the nuances of the scroll allows us to see that the Messiah is indeed the Word, and that the scroll of the Torah is, in all reality, the "scroll of the Messiah" – SEFER HAMOSHIAKH. Let us, therefore, proceed to the peculiarities of the scroll with eyes to see our Redeemer's sacrificial nature preserved upon the parchment! The majority of the structure of the scroll is the writing surface, which has to be made from parchment, that is, the hide / skin of a clean animal, which is called KLAF. Scrolls are typically made from the specially-treated KLAF of cattle, goats, sheep, or deer. The oldest complete SEFER HATORAH currently known to exist is actually made from lambskin. This factor shows us the sacrificial nature behind the creation of the Torah, and points us directly to the role of Yeshua as the Lamb who takes up the sin of the world. How is this so? 32 "And now, if You would lift up their sin... and if not, wipe me out, I implore, from Your scroll, which You wrote." 33 And YHWH said to Mosheh, "Whoever sins against Me, I shall wipe him out from My scroll." Notice carefully that this is before the Torah was written. It was still in the process of being conveyed to Mosheh and to the entire nation. Yet, Mosheh knows that Elohim has already written a scroll. The scroll He wrote existed before this conversation. 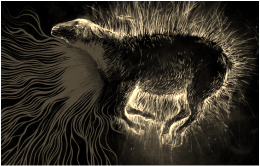 This aligns with the Lamb slain from the foundation of the world and the Torah parchment material that requires the death of an animal before it can be of any use to man. This factor is the key element behind the Torah scroll's KLAF and its relationship to the Messiah: it is built upon sacrifice, just as the purpose of Yeshua's coming was to offer Himself for our benefit and the vindication / restoration of the image of Elohim in the earth. 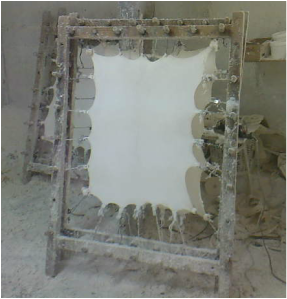 Once this skin is treated and ready for use, it is cut into sheets. The Hebrew word used to refer to these sections is Y'RIOT, which means "curtains / veils." This immediately brings to mind the first veil in the Temple which was torn in two at the death of Yeshua, which Hebrews 10:20 tells us symbolized His very flesh. The connection here is prominent; the skin must be "cut" to be made ready for use by the scribe, and Messiah's flesh was torn in order to bring redemption to us. The Y'RIOT in Scripture are most prominently used in the Tabernacle that was constructed in the wilderness of Sinai. The Y'RIOT concealed the inner room of the Holy Place and the Holy of Holies, where the Holy One Himself would commune with the people through the high priest as the mediator. In Exodus 26:7, it is recorded that these covering curtains were made from goats, which is one of the sources for the scroll to this day. In this manner, with its parallel to the flesh of the Messiah, the Y'RIOT of the SEFER HATORAH are the "clothing" that conceals the Divine Presence, just as Yeshua was filled with all the fullness of Deity on this earth while clothed in human flesh. Additionally, the word Y'RIOT is the plural of the singular term Y'RIAH, which, while being used for "curtain / veil," has the literal meaning of "to tremble," and to do so out of fear. This also points to the nature of the Messiah as prophesied in the book of Isaiah 11:2, which tells us that Yeshua would have upon Him the seven Spirits of the Holy One, and the last being the Spirit of the "fear of YHWH." The Hebrew term "fear" is YIR'AH, which is spelled similarly and pronounced similarly as the term Y'RIAH "curtain." Messiah's flesh was subdued and made obedient by the over-whelming Spirit of the fear of YHWH. Thus, the sheets of parchment for the SEFER HATORAH are aptly named, and refer once again to the dedicated sacrificial nature of the Messiah. The many Y'RIOT of the Torah are connected one to another by the act of sewing. The thread used is not just any material, but one that speaks profoundly of Yeshua's purpose to reconnect mankind with the Holy One. The material used is no common fabric, but sinew taken from a kosher animal, called GID, or GIDDIN, in the plural. The sinew used is usually from the foot of the animal, or else it can also be from the hindquarters. The sinew is removed from the animal carcass, and then is crushed repeatedly, until loosened into very fine strands, which are then able to be used as thread in the parchment sheets. The photo relates the process by which this happens in measurable stages. The way in which the GIDDIN is obtained and produced points to Yeshua, as hinted at above. Consider the connection to Genesis 3:15, which contain the words of the Holy One, and are the first prophecy of the coming of the Redeemer in the Torah. "And hostility I shall place between you and between the woman, and between your seed and between her Seed; He shall crush your head, and you shall crush His heel." Note well that the promised Seed was prophesied to be crushed at His heel, His foot - the same place from whence comes the GIDDIN that must be pulverized to be of any use for the scribe in sewing together the sheets of KLAF. Yeshua said to him, "The foxes have their holes, and the birds of the heavens shelters, but for the Son of Man is nowhere to recline His head." Furthermore, the GIDDIN offer a very surprising connection to the sacrificial role of the promised Seed in how they are sewn into the parchment. 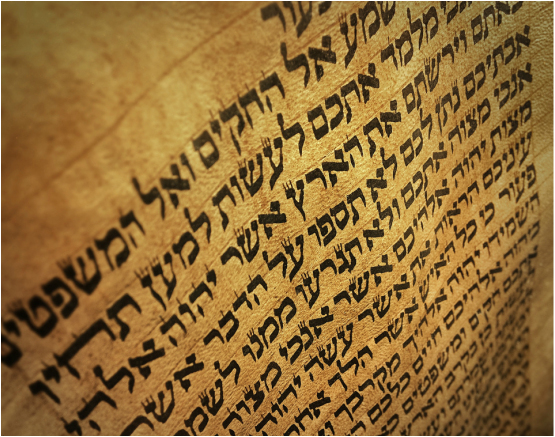 In more modern Torah scrolls, the stitch-type used is known as a "blind stitch," which allows for the reader to view the script on the scroll without seeing the sewing. This type of stitch was not used in the ancient scrolls that have survived through the centuries. The more ancient method of stitch is called the "cross-stitch." As you can probably guess, this method of stitching makes a crossover pattern that very closely resembles the English letter X. It might be difficult to make out in the accompanying image, but it is an example of a SEFER HATORAH sewn with the cross-stitch. The immediate connection to this particular detail is obviously the cross upon which Yeshua was crucified. The precise shape of the cross has been the subject of debates for many centuries, and to correctly identify it here is not the point; it is sufficient to see in this fact that the scribes of antiquity used a cross shape to connect the sheets that comprise the scroll itself! It is also worth mentioning that the X shape is itself not foreign to Hebrew, but is the exact form of the letter Taw as it was made in most Paleo-Hebrew scripts! The SEFER HATORAH, then, in its older format, was sewn together with GIDDIN stitched into the shape of crosses, which is also the form of the Paleo-Hebrew letter Taw. The choice of sewing material and technique used by the ancient scribes points straight to the Seed who was crushed for us, and the means by which He would give up His life for His people. The scroll of the Torah itself is attached to two wooden end poles / rollers. The name by which these are called is ETZEY KHAYIM, which means "trees of life." There are typically three or four holes bored through the poles through which the first Y'RIAH and the last Y'RIAH are attached with GIDDIN. In the accompanying image, the bare rollers display three holes if closely examined. The number of holes that pierce through the ETZEY KHAYIM is meaningful, since the method of Messiah's crucifixion entailed being pierced in His hands and His feet. Valid disagreement exists as to whether or not three nails or four nails were used in that horrific event. 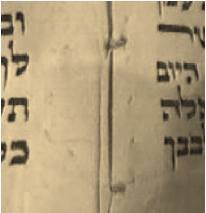 The parallel number of holes that one will find on these wooden rollers, therefore, is worthy to note in light of this detail of the SEFER HATORAH. 1 And he showed me a pure river of water of life, shining as crystal, going forth out of the throne of Elohim, and of the Lamb. 2 In the middle of the street of it, and on this side and that side of the river, was the Tree of Life, which produced twelve fruits, and rendered her fruit every month, and the leaves of the tree were for the healing of the nations. What is pictured here syncs amazingly with the opened SEFER HATORAH. 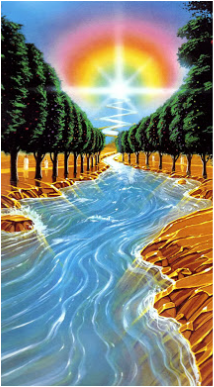 The ETZEY KHAYIM are present on either side of the river as the Tree of Life, which, although spoken of in the singular, can only be rightly understood as sending up at least two shoots on either side of the waters. And many peoples shall walk, and they shall say, "Let us walk, and ascend unto the Mountain of YHWH, toward the House of the Eloah of Ya'aqov, and He shall instruct us from His ways, and we shall walk in His paths, for from Tziyon shall go forth Torah, and the Word of YHWH from Yerushalaim." This shows us that what goes forth from Jerusalem when Messiah sits on His throne is actually the Torah, which means that the imagery in Revelation 22:1-2 is symbolic of His Word. Thus, the water that exists between the two trees of life is a portrait of the SEFER HATORAH and the trees are the ETZEY KHAYIM at the beginning and end of the scroll! All of this should be considered with the fact that Messiah hung also from a tree, between two others hung likewise, and at His death, as is recorded in the book of John 19:33-34, a soldier pierced His side, from whence came not only blood, which would be expected, but water, as well. The ETZEY KHAYIM, while not seemingly an actual part of the scroll itself, are yet seen upon further examination to be deeply significant to the entirety and symbolism of the Messiah and the healing that flows from His sacrifice. Before any text can be written upon the scroll, the scribe must rule the KLAF of each Y'RIAH with SIRTUTIN, "lines" that will guide the script in a straight direction for each column in the Torah, as well as serve another purpose to be discussed at a later point. This ruling is done in a unique manner. No base metal instrument is allowed to mark the prepared KLAF, as such instruments are considered by the rabbis to be unbecoming for use on a document of beauty. Therefore, the scribe utilizes a special stylus to score lines into the surface of the Y'RIAH. This is done by affixing a thorn to the end of a stick or other wooden object, and raking it across the surface, leaving a light, but visible line in the KLAF. Such an instrument is called a SARGEL, meaning "ruler." The accompanying photo is of a SARGEL I made. Some modern scribes will now use wire impressed upon the KLAF to leave the lines needed, but the ancient method, and one still very much in use today, is to score the Y'RIAH by hand with the sharp point of a thorn. Indeed, the term for "lines" is SIRTUTIN, from the Hebrew SARET, which literally means "cut / incision." This is exactly the result of a thorn scraping flesh, and exactly what happened to Yeshua at His crucifixion! This usage of thorns cutting and scarring the animal skin of the SEFER HATORAH very quickly brings to mind the use of the crown of thorns that was so mockingly placed upon Yeshua's head at His crucifixion. The element of thorns to rule the KLAF and its connection to the sacrifice of Messiah is a powerful insight. While it might not be an immediate connection with the crown, however, since it is not upon the "head," so to speak, of the SEFER HATORAH, the parallels actually do exist, and go much deeper, as we shall see. In the first book of the SEFER HATORAH, the book of B'REYSHEET (Genesis), which has the relevant literal meaning of "at the head," we find the account of our father Abraham being told to offer his son, Isaac, to the Holy One. The account is recorded in Genesis chapter 22. The verse of particular interest is 22:13, where Abraham's hand is stayed from sacrificing his son, and when he lifts his eyes, he sees instead a ram nearby whose horns were caught in a thicket, and who is then offered in place of Isaac. This is significant, because the term for "thicket" in the Hebrew is the word S'VAK, and while it actually means "interwoven," it is used to describe the abundant growth of thorn bushes in Scripture! Therefore, what Abraham saw was a ram who was caught in a thorn bush by the horns on its head! As amazing as this is, however, this link concerning this matter of the lines on the SEFER HATORAH and the crown of thorns on the Messiah goes even further. As explained above, the lines that are scored on the KLAF by the SARGEL with the thorn are called SIRTUTIN. These lines guide the flow of text that will be written by the scribe so that it flows across the Y'RIAH in a straight manner. Much like lines on the pages of a notebook, so function the SIRTUTIN. However, there is a major difference between the lines on a notebook and SIRTUTIN that is worth noting: while text is written upon the lines in a notebook sitting on the line itself, in a SEFER HATORAH, the Hebrew letters actually "hang" suspended from the SIRTUTIN! Look closely at this image from a scroll and you will see that the letters are positioned in such a way that they literally are hanging down from the line above them, not sitting on the line below! All of the Word points to the Messiah, and the SEFER HATORAH conceals this very reality. Yeshua knew it to be so, and declared it to those who were willing to listen. Although the majority of the Hebrew people unfortunately did not recognize Him at His first coming, they also yet acknowledged the preeminent nature of the Messiah in the Hebrew text, as they even recorded this sentiment in their own writings. These realities are preserved in the SEFER HATORAH with the thorn-scarred SIRTUTIN that contain no written text. The sheer importance of these lines throughout the scroll is underscored (pun intended) by Yeshua Himself in the book of Matthew 5:18, where He speaks of the permanence of the Torah even in its minutiae. The word the English translations typically render as "tittle" is, in Yeshua's own words, preserved in the ancient Aramaic text of the Peshitta with the term SERTA "line." This term is the Aramaic cognate of the Hebrew word SARET, the singular of the plural SIRTUTIN! Yeshua, in His native Aramaic tongue, appears to have declared that not only would a single letter YOD not disappear from the Torah, but neither would any of the lines scored into the text by thorns! Even the very lines that wound the KLAF are necessary until the end of time, in the Spirit-led opinion of our Messiah! They herald the complete Word of the Holy One that is a witness to the only way that sin-scarred man can return to Him: through the Son of Elohim, who was scarred by thorns in His sacrifice for us. It is with these ingredients that the D'YO is made and from which every letter in a SEFER HATORAH is written. Medieval Jewish commentator Rabbi Moshe ben Maimon, known also as Maimonides, or the RaMBaM, mentions that honey and soot can also be used, but are not necessary, so long as the above ingredients are definitely included in the recipe for D'YO. In fact, the oldest and most complete Bible in existence, the Codex Sinaiticus, was written with ink using only the above ingredients. A closer look at the individual ingredients, then, will display how similar the parts are in relation to the sacrificial death of Yeshua on the cross, and amazingly, each one parallels a specific event that happened on that wood. The AFATZIM, or gall-nuts, are essentially arboreal tumors made by a tree in response to a gall wasp which lays its eggs in the branch of the tree. The presence of the wasp larva evokes a reaction from the tree that begins to surround the insect with a hard spherical scar. The chemicals found in the AFTZA "gall-nut" are necessary for the recipe of D'YO. The hard gall-nut contains gallo-tannic acid, which is present due to the placement of the gall wasp larva into the branch and the tree's subsequent attempt to cope with the foreign object. Thus, the key element in the creation of the AFATZIM is actually the wasp itself. In Hebrew, the term for "wasp" is TZIR'AH, and literally means "piercer," obviously referring to the sting of the insect. This wasp cuts into the branch of the tree and lays its egg, which creates the gall-nut which is essential for the recipe for D'YO. Thus, the wasp's nature of piercing is what starts the process that eventually leads to a usable ingredient for ink in the SEFER HATORAH. This detail points to the piercing of the Messiah on the cross. The QANQANTUM, or iron sulfate, is a key ingredient in the recipe, for it interacts with the gallo-tannic acid of the gall-nut and actually begins a chemical process where it burns into the KLAF itself. This process makes for a very durable ink, as it almost becomes part of the skin of the scroll. However, there is a danger in this process, for if the gallo-tannic acid and iron sulfate are too high in the D'YO, the chemical process can sometimes, after many, many years have passed, cause the underlying KLAF to be entirely eaten away, leaving holes in the SEFER HATORAH that are essentially in the shape of the letter originally written by the scribe! The accompanying photo shows an example of such holes. The ink, due to the presence of iron sulfate interacting with the gallo-tannic acid, literally pierces the scroll all the way through! The "piercer" creates the gall-nut, and the second ingredient, when combined with the first, also helps to perform a very real "piercing" of the SEFER. With that being the case, the reader may well be wondering exactly how iron sulfate was anciently obtained for this particular recipe. This is where the historical traditions behind the creation of the SEFER HATORAH once again are amazing in how they align with the sacrificial nature of the Messiah. The iron sulfate used from antiquity in the preparation of D'YO was typically obtained by placing iron nails into the boil of ingredients and allowing them to oxidize and yield the iron sulfate necessary for the black color of the ink! The photo included is of Roman-era nails that would have been very similar to, if not the same as, the nails used in the recipe for D'YO. The piercing link to the Messiah on the cross is very strongly established in this detail. The ingredient of KUMA, gum Arabic, is vital in the recipe, for it basically holds all the other ingredients together. Despite its name, it does not originate largely from Arabia, but from Africa. It was often sold by wandering Arabian traders and made available to the Middle East through their hands, and that is why it carries the name it does. The ingredient itself is really just sap exuded from an Acacia tree. Harvesters collect the "tears," as they are called, that form and sell them for many different uses, from food industry to art industry, and more. The fact that the KUMA is taken from an Acacia tree is significant. It is only the Acacia tree that produces this type of sap that is used in D'YO. The Acacia tree is a tree mentioned twenty-seven (27) times throughout the Torah, and only once more outside of it, in the Prophets. What is the Acacia tree, exactly? The Hebrew term is SHITTIM, and comes from the singular word SHOTEYT, which has the meaning of "to pierce," likely due to the presence of thorns on the tree, as well as for the KUMA that exudes from its wood. This Hebrew meaning of the tree from whence comes the binding agent for the ink of a SEFER HATORAH cannot be ignored, for it aligns precisely with the "piercing" nature of the other two ingredients in the ink recipe already mentioned. There is no way to deny the astonishing reality of this "piercing" concept that is a common factor among the ingredients for the ink. It is a most interesting detail that parallels the nailing and piercing of the Messiah on His cross. The final key ingredient for D'YO is MAYIM, water. The MAYIM is the ingredient in which all the others are boiled and so are joined together. Without it, the other ingredients would be ultimately useless. The water makes the liquid of the ink. 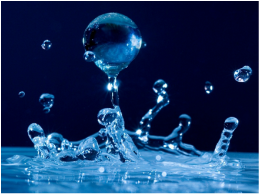 Each of the other ingredients in the recipe for D'YO find a common ground in the piercing of Yeshua, and the water ingredient is no different. At the crucifixion of Messiah, in John 19:33-34, after His being nailed to the cross, He triumphantly gives up His Spirit to the Holy One. Surprised at His unnaturally-speedy death, a centurion proceeds to stab the side of Yeshua's torso, to make certain He was truly dead. At this piercing, both blood and water gush from His dead body. In this way, the "piercing" connection to the water is quite evident once more. Every ingredient in the ancient recipe for D'YO is a link to the sacrificial piercings endured by Yeshua on the cross. Each nail, each cut, each puncture, was yet another evidence that He is the Word made flesh. He was being inked with the inspired will of the Spirit that would buy our freedom. The last aspect that will be touched upon concerning the SEFER HATORAH is the instrument used by the scribe to apply the D'YO discussed above. No ordinary pen bought from a store can be used for this holy purpose. Rather, an object without a metal tip must be employed for writing upon the KLAF. This is done very widely today with a quill, and is called a QULMUS. The scribe dips the end into the D'YO and proceeds to write the text on the scroll. 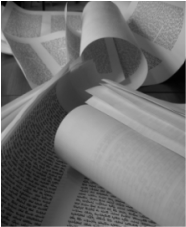 This method of writing a SEFER HATORAH is quite popular, and yet it is not the ancient method used in Biblical times to place the D'YO upon the scroll. The reality of this detail can be seen in the very word QULMUS itself, which is a Greek loanword into the Hebrew language, originally being KALAMOS, and in that tongue, means simply "reed." A feathered quill is by no means a reed, and discloses for us the true nature of the original writing utensil used for a SEFER HATORAH. The original tool was, in fact, simply a reed cut and dipped into D'YO to write upon the KLAF. These reed pens are the QULMUS style that would have been used in antiquity by Hebrew scribes to produce a new scroll of the Torah. In what manner does a reed's key usage in the production of a SEFER HATORAH point to the Messiah as the Word? The answer lay in the fact that Yeshua came into contact with a QULMUS three separate times in the events leading up to, and immediately before, His death upon the cross! And they spit in His face, and they took up the reed, and they were striking Him upon His head. And in that hour, one from them ran, and took up a sponge, and filled vinegar-wine, and set it on a reed, and it was drink for Him. The same type of utensil used to write a SEFER HATORAH was also used to mock and beat Yeshua in the moments before His crucifixion. This detail is amazing, and yet a further aspect makes it even more so. Note the detail given in the third instance the reed is used in the presence of Yeshua: upon the end of it is placed a sponge filled with vinegar-wine. It may almost be uncanny to consider, but one way that the scribe is allowed to make the D'YO that has been prepared for writing with the QULMUS go on the KLAF all black and glossy is to add into the finished recipe of ink either vinegar or wine! Scribes have even noted the sentiment that the best quality D'YO smells quite vinegary! Therefore, what we see preserved in the actions towards Yeshua at His crucifixion is a reed at the end of which is vinegar-wine that is given to Him, just like the scribe, from antiquity, writes with a reed pen in D'YO, to which is added vinegar or wine to make the letters stand out brilliantly on the KLAF! The SEFER HATORAH is a wonderful gift to mankind. It is the desire of the Holy One for us on how we are to live righteously in a world scarred and marred by our disobedience to Him. It is wisdom for us. It is blessing for us. It is a reminder of our inability to save ourselves. However, it is so much more. Yeshua stated that it points to Him. This study has endeavored to display exactly how such parallels have been concealed and preserved in the nuances of the Torah scroll. The Holy One has carefully watched over the process by which His Word comes to mankind, because in its physical makeup is the powerful portrayal of the redemption we are given by the sacrifice of His only Son. Behold the Torah!! Behold Yeshua!! 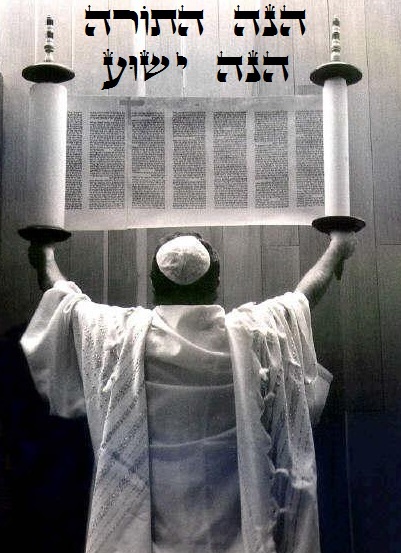 Truly, Torah is the SEFER HAMOSHIAKH - the scroll of the Messiah!